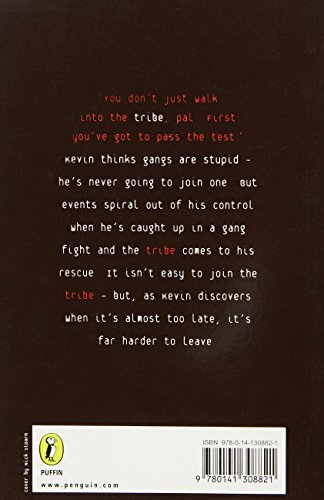 Tribes is a strongly plotted argument against the gang mentality. Kevin is drawn into The Tribe, a gang under the sway of the charismatic Salom. Seduced by the excitement and camaraderie of the in-crowd, Kevin undergoes a dangerous initiation ritual in which he puts his life at risk. Only gradually does he realise how much truth there is in the warning graffiti on the street corners: SALOM IS EVIL. There is plenty of tension and incident, and the story would read aloud well to nine- or ten-year-olds. However, its grasp of character and setting is not so sure. The age of the main figures in the novel and their social background is vague. They appear to have the freedom and daring of 13- and 14-year-olds but the interests and emotions of younger children. The child depicted on the cover looks younger than eleven. This lack of clarity may mean that the story lacks the punch that it ought to deliver.